Less campy fun than clash of the titans and less artistic than 300, this movie doesn’t measure up to the films it longs to emulate. I knew immortals wasn’t going to be anything great, when i went to see it, but i wasn’t looking for great. I was looking for visually cool. the movie was directed by a guy named tarsem singh. He’s an indian director who’s only other movie that people really saw was the cell, from over ten years ago (Released in 2000), with jennifer lopez. That movie wasn’t great either, but it was certainly visually striking. this director seemed to be a man with a vision. he came from making music videos, and now, with immortals it seemed that he had a substantial budget to work with. The other reason i wanted to see the movie was because of the basic content. now i knew the plot wasn’t going to be anything great, but i generally like greek mythology movies and the way that in the last few years we have slowly gotten more and more of them, and how each one just reveals a little more than the last about what was going on. FIrst, we got troy, which was based on the iliad. I didn’t care for it. For one thing, there were no appearances by the greek gods, and in the iliad by homer, the gods play a big part of the story. then there was 300, which was outstanding. the best greek story yet. it might not have been about mythology, and more about history with the spartans fighting the persians, but that’s okay. it was artistically tremendous. there hasn’t been a good greek mythology or history movie since then. we got clash of the titans, which was a joke of an action movie. yes, it featured the greek gods, but it was silly with regards to the dialogue and plot points. nothing about it could have been taken seriously and it’s a real shame because the movie had potential. directed by louis letterier, the guy who made the transporter movies, i shouldn’t have been surprised that the movie was crap. letterier also made the edward norton hulk movie, which i actually liked, but apparently i’m the only one. and that brings us to the immortals. With clash of the titans, our hero was perseus, which meant you know we were gonna see medusa. in greek mythology, some of the two most famous heroes and beast slayings are perseus killing medusa and theseus killing the minotaur. well, theseus is the star of the immortals. that’s another reason i wanted to see it. i figured if he’s the star of the movie, than they have to give us a fight between him and a minotaur, right? I suppose they did that, but i’m not even completely sure. the movie features a fight between perseus and a large guy dressed up like a minotaur. the bull’s head that this man wears is a helmet and it’s meant to look like a helmet, where you can even see through it a little bit, to know that there’s a man’s head in there. I suppose the reason is that tarsem wanted to ground this movie in reality, to a certain extent, and so while he does have magical bows and arrows and he does often show the gods, he refuses to put any monstrous beasts in his movie. when told that he has to at least include a minotaur fight (perhaps by the studio), he comes up with this, dressing a man up like a minotaur. the fight does take place in a sort of labyrinth, and so i suppose it covers the basics of what needed to be there, but i would have much preferred a flashback to the real myth. 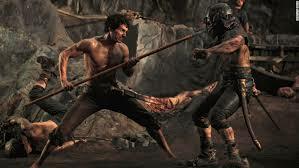 the myth of theseus and the minotaur deals with how the king had to send human sacrifices over to the minotaur and how the king’s son theseus went and slayed the beast. that myth ends with theseus forgetting to change the sails on his ship from black to white, so that when the king sees the ship coming from far off he will know if his son survived. and so when the king sees the black sails, he thinks his son is dead, and he takes his own life, throwing himself into the water. it’s a great myth and it would have explained why theseus has no father in the movie. not to mention, on his way from crete to minos (where the minotaur is) theseus runs into all kinds of cool villains on the road who he has to defeat. but that is not this story. in fact, the movie seems to want to bypass the theseus story in almost it’s entirety. the minotaur fight is rushed so much, that we don’t even realize theseus has entered the labyrinth until he’s already face to face with the beast. i hate to say it, but the movie your highness, which was clearly meant to be a comedic spoof, did more with greek mythology than this movie did. that film really did feature a minotaur in a labyrinth and it also featured a many-headed hydra, which is the beast that hercules must tackle (another greek myth story that should be put to the screen by giving him his own movie, other the the disney one). 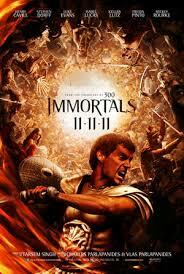 Tarsem’s immortals movie is weak on both story and on action. i expected the story problems, but not the action ones. when we do get an action scene, it looks fake. it seems like there is no way one man could take on so much without getting stabbed somewhere in the process. when he throws something in the air or launches an arrow, we follow the arrow to it’s target, as if that’s what is important. and i keep thinking, what about all the fighting that’s still going on behind it? these people aren’t stopping to watch where the arrow goes, so why are we? it would be one thing is the arrow or javelin moved through the air quickly, so that it took but an instant, but tarsem makes things fly through the air in slow motion, so that us following it means that we are missing all of the fighting that’s still going on behind it. The movie stars mickey rourke and henry cavill. Rourke has a good, deep voice which is perfect for the dark role he plays. but what’s with all of the silly head gear? One scary mask would have been far cooler than the collection of them he switches too, most looking pretty dopey. he’s got one that has teeth all around it and looks like a cartoon, and another one that looks like it’s got scissors on it’s head. cavill, meanwhile, it the actor who has been tapped to play the new superman for zack snyder, and there is nothing in this movie that shows he can act. yeah, he has nice abs, but that’s about it. i suppose it’s not his fault though. it’s the lousy movie’s fault with it’s lousy script. the movie is bad because it’s boring. the plot doesn’t really go anywhere and is very simple. both hyperion and theseus want the bow. theseus finds it, then hyperion gets it, and then there’s a battle at the end. that’s really it. there is cool imagery here and there, like the bow itself which produces it’s own arrows when the string is touched. but it’s not enough. when the gods do fight, the action is amazing. they move at rapid speeds and then send bodies into the air, all sliced up in slow motion. it made me think, if this director could do this with action, why wasn’t he doing it the whole time throughout the film? why was all of the other action so bad if he’s capable of action like this? But then even the gods fighting he finds a way to screw up. i don’t really want to say how and give anything away, but let’s just say the titans should have gone down quickly and for some reason they don’t. this is not a good movie. i like it better than clash of the titans, because at least it’s not silly, but both movies are pretty bad. the visuals that i hoped would be here are not. whatever potential this movie had is quickly squashed and we get a pretty boring film in it’s place.